Prevent Lice WITHOUT the Nasty Chemicals! We use specific essential oils that have been shown to prevent and kill lice! Ingredients: Purified Water, Decyl Polyglucose (non-gmo corn), Vegetable Glycerin (coconut), Organic Apple Cider Vinegar, Organic Essential Oils of Tea Tree (Melaleuca Alternifolia), Rosemary (Rosmarinus officinalis, 1,8 Cineolr), Lavender (Lavandula Angustifolia) & Geranium (Pelargonium Graveolens), Xanthan Gum (non-gmo corn). For best results, use as a preventative measure. Can be used to prevent infestation after initial exposure. I have dreads. I was using a different Organic Dread Shampoo Bar prior. I didn’t realize how limp my dreads were. This is the BEST! Low lather and not over powering smell. 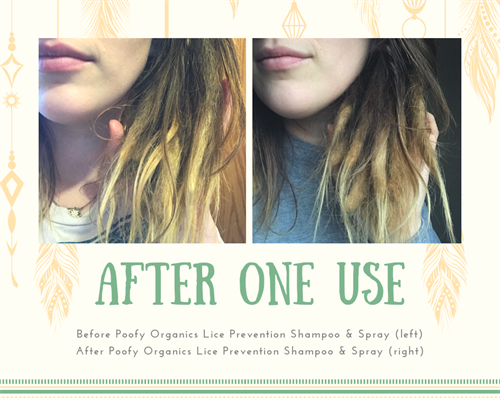 Picture is a before and after the first time I used it. Use this in my kids' hair each time we wash. Haven't had any issue with lice yet, but it is nice to have some prevention in place just in case. Nice, light smell.